A “Call” From Pondicherry—Dr. Prabhat Sanyal’s article on Sri Aurobindo’s Mahasamadhi. 5 December 2014 marks the 64th anniversary of Sri Aurobindo’s Descent into Death. On the said occasion, an article titled A “Call” From Pondicherry (originally published in the December 1953 issue of Mother India, the monthly review of culture published by Sri Aurobindo Ashram, Pondicherry) penned by Dr. Prabhat Sanyal on Sri Aurobindo’s Mahasamadhi has been published in the online forum of Overman Foundation. Dr. Prabhat Sanyal (18.10.1903—30.7.1978), F.R.C.S. had treated Sri Aurobindo during His last illness. He was the second President of Sri Aurobindo Pathamandir, Kolkata. The second Chief Minister of West Bengal, Dr. Bidhan Chandra Roy, wanted to make him the Chief Pediatric Surgeon but he declined the offer. He settled in the Ashram in the mid1950s and was the Mother’s physician. On the evening of the 29th November 1950, as I was resting after a heavy day, a servant brought me a telegram which read: “FLY—URGENT—MOTHER”. Never could I have imagined the amount of meaning there was in those few words. Then it came to me—Is Sri Aurobindo ill?—Why otherwise would the Mother send such a telegram? Other thoughts crept into my mind and I could not decide how best to equip myself for the errand. The next morning, 30th November, I flew to Madras, only to find that the next train for Pondicherry did not leave until 9-50 p.m., and so I would reach my destination by 7-a.m. the next morning. It was a torment to think that after traveling 1000 miles in 5 hours it was now to take me twenty hours to cover 100 miles. I looked at the telegram—read it once again—No! I could not waste time, so I hired a car. It took me an hour to obtain a permit from the Police authorities, who looked me over thoroughly, trying to decide whether I was a smuggler or some thirsty drinker wanting a joy ride to French India. They finally decided however that I could go. The driver being assured of extras, my car literally flew along the roads to Pondicherry having only to stop twice at the inefficient and rude customs barriers—and by six in the evening I was at the Mother’s feet in the Ashram playground. As usual She greeted me with her heavenly smile, saying She had expected me that very evening. She then told me of Sri Aurobindo’s illness and asked me to examine Him; She added that She would be coming to his room after the programme was over in the playground. On the way Dr. Nirod of the Ashram and my young colleague Dr. Satya Sen acquainted me with the history and present condition of the Master. Softly but quickly I ascended the stairs and entered the room. There I looked on the Master, my divine patient, semi-recumbent on His bed, seemingly unconcerned, eyes closed, like a statue of massive peace. I approached the bed, knelt by His side and made my pranams at His feet. Champaklal called: “Look, Master, who has come.” There was a quiver on His face; heavy eyelids opened a little—then all was still again. But again Champakial called: “Master, see, Sanyal has come.” This time He opened His eyes fully, looked at me and smiled—Oh such a smile, serene and beautiful, it carried one to ecstasy, lighting the innermost corners of the heart. He placed His hand on my head and lovingly patted it a few times—all thoughts vanished, it seemed my heart had stopped. I was overpowered with a mighty peace and calm. He had closed His eyes—except for His respiration all was still and a great silence reigned. Then Champaklal whispered delightedly, “He has given you a Darshan Smile and Blessing.” It was a blessing no words could describe; only one who has seen it and known it in his heart could appre¬ciate what it meant, it for it was an experience of the soul. I waited for the opportunity to become the doctor. I asked Him what the trouble was and whether I could give Him any relief. I put to Him the regular professional questions, perhaps then forgetting that my patient was the Divine housed in a mortal frame, and He answered: “Trouble? Nothing troubles me —and suffering! one can be above it.” I mentioned the urinary difficulties. “Well, yes”, He answered, “I had some difficulties but they have been relieved, and now I do not feel anything.” Again there was silence. We retired to the next room and I had a consultation with Nirod and Satya. His urine analysis report had arrived, showing slight albumen and sugar, specific gravity a little above normal. The Mother now entered the room and stood in silence near the foot of the bed and watched Sri Aurobindo. Soon She called me out into the next room where I explained the position to Her, that He was suffering from a mild kidney infection—otherwise there was nothing very serious as far as could be judged from the urine report. We thought that, deo volente, continuous drainage would suffice and antibiotics would gradually improve the rest. The following morning, 1st December, was very encouraging; our Lord was absolutely alert and responsive and His temperature was normal. After His sponging He took His simple breakfast and even cracked jokes with us. I was giving Him a scalp massage and enquired if He was liking it or not. He remarked: “I know you went to England for your Fellowship but where did you learn massaging?” I suggested that we would like to have His blood exa¬mined for a detailed bio-chemical examination, to which He smiled and retorted: “You doctors can think only in terms of diseases and medicines, but always there is much more effectual knowledge beyond and above it. I do not need anything.” All of us were very happy by this most remarkable improvement and the day passed on. The next day, 2nd December, there was little change except for a rise of one degree in temperature towards the evening. The day was a heavy one for the Mother as it was the second day of the annual display in the playground; but as soon as the activities were over She came to His room and stood at the foot of His bed. Her countenance was very grave but She did not say anything. I suggested, as the urinary infection was again flaring up in spite of continuous drainage, that we should try Antibiotics and Infusion therapy. Mother then warned me that orthodox methods of treatment were unsuitable for Him—not only would Sri Aurobindo not like them but they would be harmful. She also reminded me that my patient was the Divine, “He will work out whatever is necessary.” I could only give some simple medicines to allay symptoms if any. We doctors were in a state of perplexity; true, our patient was an Avatar; true, He had cured innumerable ailments in the sadhaks as also in Himself several times—would He not now cure Himself? Champaklal once entreated Him in a favourable moment: “Why don’t you use your force and cure yourself, Master?” He kept silent and showed rather a dislike for such questions. December 3rd—After a rather quiet and restful night He looked better that morning and when the usual morning routine was over Nirod offered Him some fruit juice which He enjoyed. As the darkness closed in upon us our hearts grew heavier. At times Nirod or Champaklal would offer Him sips to drink and He would even remark on His choice of tomato or orange juice or something of that sort, then would lapse back into a state of unresponsiveness. Not once would He say or at any time indicate that He was uncomfortable or thirsty, but if we changed His position or offered Him a drink He smilingly accepted it. The Mother came at 11 o’ clock at night as usual; the moment She offered Him a drink He was all alert and obediently drank a cupful of fruit juice—then again He lapsed into a state of repose. The distress continued now with little sign of abating and The Mother took me into the ante-room remarking: “I don’t know, He has no interest in Himself.” I suggested intravenous medication from the next day onwards, but She advised me not to disturb Him. We continued keeping a careful watch on the urinary flow and He was still passing 50 ozs. in 24 hrs. at specific. gravity of 1012- 1010. Nirod would sit by the bottle and watch each drop as it fell and if there was any delay, which was often the case, he would immediately draw my attention to it. December 4th—At dawn His temperature had dropped to 99 degrees. The respiratory distress was negligible and He seemed bright and responsive. The morning duties were over and we settled Him in His usual sitting position. There He sat majestic and serene. At about 9 a.m., The Mother came and helped Him to take a light breakfast. As She walked into the ante-room, the room used for our consultations, I smiled to Her and said; “The Master seems cheerful again and taking interest.” The only answer She made was “Mmm” and then went out of the room. I settled by the side of the bed and gently massaged the Master’s body while Nirod and Champaklal were attending to their duties. After a little while He opened His eyes and asked the time. I told Him 10 o’clock, I saw He was in a mood to talk so I ventured: “How do you feel?” He replied, “I am comfortable.” There was a pause; He looked at the clock and then asked how Bengal was faring, especially the refugees. I narrated to Him their pitiable plight and implored: “Surely the Divine can help them?” My Lord answered, “Yes, if Bengal seeks the Divine.” He closed His eyes and went into silence (samadhi). But alas, it was only a brief lull — a belied hope. From midday the respi¬ratory difficulty reappeared with greater amplitude and the temperature went up to 102 degrees. This time signs of distress could be seen in the face but there was not a word, not a protest. Though He looked apparently unconscious, whenever He was offered drinks, He would wake up and take a few sips and wipe His mouth himself with His handkerchief. To all of us it seemed apparent that a consciousness came from outside when He was almost normal, and then withdrew when the body quivered and sank down in distress. He was no longer there! By 5 o’clock again He showed signs of improvement. He was quite responsive. We helped Him out of His bed. After which He walked to the arm-chair to rest. For the moment He seemed a different personality. He sat there with His eyes closed — calm and composed with a radiating consciousness. We remarked on the majestic beauty of His form as He sat there; such calm and beatitude brought to my mind the Vedic Rishis. But this did not last long. After three quarters of an hour He became restless and wanted to be back in bed. Respiratory distress appeared with redoubled momentum. From midday onwards the urine output which had been good all these days definitely diminished and the distress was very prominent. Though He seemed to be unconscious He was not, which was evident by the fact that He drew Champaklal several times to His breast and kissed him lovingly and this Divine compassionate embrace was extended to Nirod and myself. It may be mentioned that this emotional behaviour was evident here for the first time; but He had taken nothing to drink the whole day. We sat round His bed, wondering why He was losing interest in Himself; He, if He so desired, could certainly cure Himself as He had done on so many other occasions,— Nirod has seen Him curing the illnesses of others. But now at this crucial hour He had no interest in Himself! Was He going to sacrifice Himself? At about 11 p.m. the Mother came into the room and helped Sri Aurobindo to drink half a cup of tomato juice. A strange phenomenon—a body which for the moment is in agony, unresponsive, labouring hard for breath, suddenly becomes quiet; a consciousness enters the body, He is awake and normal He finishes the drink, then, as the consciousness withdraws, the body lapses back into the grip of agony. At midnight the Mother came again into the room, looked intently for some time as if there was a silent exchange of thought between them; then She left. I stood behind the Master and started stroking His hair which He always liked. Nirod and Champaklal sat by the side of the bed and were caressing His feet. We were all quietly watching Him. We now, knew that anything might happen, any time, only a miracle could save us and the world. I perceived a slight quiver in His body, almost imperceptible. He drew up His arms and put them on His chest, one overlapping the other—then all stopped. Death, the cruel death that was waiting so long—we had been keeping vigil for it —had descended on our Lord. I told Nirod to go and fetch the Mother. Almost immediately the Mother entered the room. She stood there, near the feet of Sri Aurobindo: Her hair had been undressed and was flowing about Her shoulders. Her look was so fierce that I could not face those eyes. With a piercing gaze She stood there. Champaklal could not bear it and sobbingly he implored, “Mother, tell me Dr. Sanyal is not right, He is alive.” The Mother looked at him and he became quiet and composed as if touched by a magic wand. She stood there for more than half an hour. My hands were still on His forehead. My mind wandered. 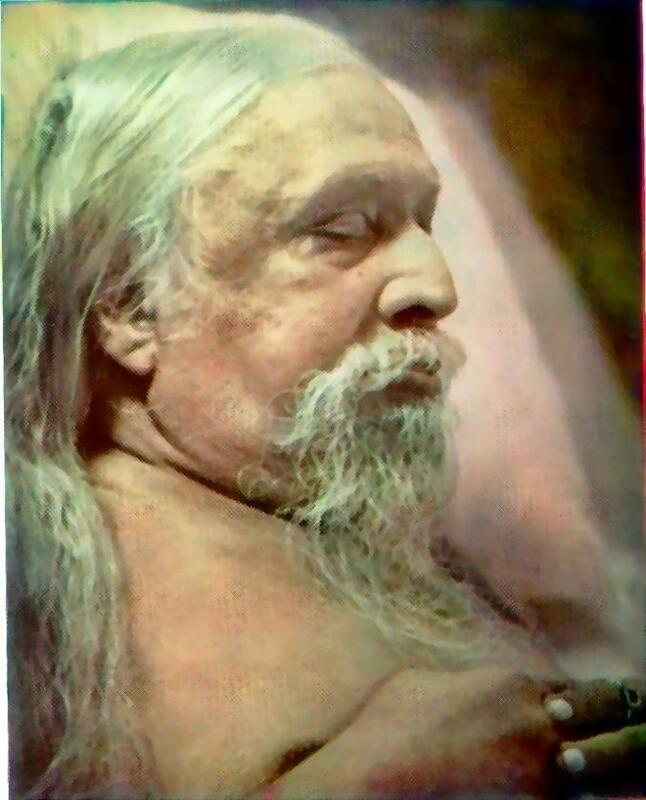 He lay, my Guru, Rishi Sri Aurobindo, Avatar of the new era of the dawn, a thing past! Only a few seconds ago I was watching and hoping for a miracle to happen; could there be a more appropriate time than this? Sri Aurobindo is no more! He was alive, and now He is history. Thoughts kaleidoscoped in my brain. I could almost see thousands of people passing by the bed, whispering aloud — “Here lived Sri Aurobindo.” But it cannot be; I am standing here by His side, my hands almost touching Him, I am watching Him breathe, yes, every movement, all is much more quiet now,— I could not think; any more. A sharp pain went through my head. I looked at the Mother. Softly She came to me and touched my head, stilled my thoughts, quietened my mind. No trace of agony was left, I could now think normally. I asked Her, “What is to be done, we have to arrange for the last offices.” She quietly said, “He will be given Samadhi, under the Prayer tree, in the pace where the giant maidenhair plants are arranged.” So, this place had been earmarked beforehand; such is the way of the Divine! The Mother also reminded me of the formalities that had to be observed, a French doctor must certify the death first. Then only members of the Ashram and the public could be informed. Nolini Gupta and Amrita were called and stood there as if stunned. Pavitra stood at the feet of the Master, tears rolling down his cheeks. We were busy in dressing the Lord. The Mother had already agreed to my request to call the Ashram photographers (sadhaks) to take the last pictures. The French physician of the Hospital, Major Barbet, examined the Master’s body and we both signed the death certificate. Now the sadhaks of the Ashram were to be informed. It was now dawn, the eastern sky was slowly getting clearer and clearer, a shaft of light appeared over the horizon. Quietly I left the Ashram. As I sat by the window, bewildered, in my room at Golconde, I saw the hurried but silent progress of the Ashramites towards the Ashram.— Sri Aurobindo has passed away— I felt a violent pang in my heart. I looked at the sky. Look!… There, Sri Aurobindo is rising again—the eternal Sun bursting forth with a million rays. As the day wore on, longer and longer became the stream of people, eager but calm and patient, to have a last Darshan of the great Rishi. In the afternoon I again entered the room where our Lord lay serene and majestic. A never-ending stream of people, laymen, clergymen, doctors, lawyers, rickshaw pullers, labourers, rich men, poor men, all filed past the sage, silent but inspired. At dusk the Ashram door was closed. The Mother blessed me, asking me to come again early in the morning. I left for Golconde. Champaklal and Nirod were keeping vigil night and day. I was then kneeling by Sri Aurobindo’s bed, by the Mother’s feet. She smiled at me and with infinite compassion put her hand on my head. There He was—with a luminous mantle of bluish golden hue around Him. After that night, there dawned on us the third day of Sri Aurobindo’s passing. The Mother and I had a look at His body. As yet there was no sign of decomposition. The French surgeon corroborated the findings, this being required by the law of the state. Sri Aurobindo’s sudden decision of withdrawal stirred the minds of us all. Was it a retreat? Or was it a means used by Him to attain something for the earth? Who can answer? With our limited mental logic, whatever we try to explain will only be part of the truth, or may even be a distortion. What we need is a supreme faith in Him that if many a battle is apparently lost the ultimate victory of the war is inevitable. Sri Aurobindo has no doubt withdrawn from us, from our physical eye, but the Mother is continuing the fight for humanity as the Mahashakti. While we all feel as if we were sliding down the incline to disappointment, — for the world torn with dissension, distrust, hatred and greed, looking for a ray in the sky, a divine gesture — for the uplift of humanity — a transformed humanity — the Mother holds out HOPE. I took leave of the Mother on the 7th evening — taking a last look at the Master’s luminous body,— the Divine in a mortal frame, beautiful, calm, and still without a sign of decomposition. I naively asked the Mother, “Why was I not allowed to treat the Lord as I would have done in the routine way, and why was I called in?” Mother consoled me by saying, “We wanted you to be here, not so much for treatment.” The Mother blessed me three times and all my sorrows, my disappointments, my doubts vanished, and my mind was aglow with hope. I bowed at Her feet. and looked up to see the Divine Mother, the Mahashakti smiling at me. Previous PostEpistolary Exchanges Between K. M. Munshi and A. B. Purani about Sri Aurobindo. Dear Anuragji, Extreme tearful gratitude to you for a first hand narration of the event. Regards Dayanand It is all too stunning. I am overwhelmed, thanks for bringing Dr Sanyal’s article on Sri Aurobindo’s withdrawal. No words come to mind after reading this. Thank you very much, Anurag for sharing this. It was a text full of inspiration and peace. Hope we too are blessed by our Master. All the best. I never knew I was still capable of shedding tears. This is one of the most precious gems carrying the full presence of Sri Aurobindo and Mother.